I once read this comment about Connan Mockasin: “He knows something we don’t”. It’s funny, and probably true. After numerous albums and collaborations, it’s still refreshing to follow each of his steps down a musical rabbit hole and parsing exactly what it is he’s being serious about, if anything. It feels as if there’s an ever-present inside joke behind the seductive sounds, and if his tongue isn’t planted in cheek, it might be sticking right out at you. The thing is, as you peel back the layers and read up on the method behind the ever docile madness, you’ll find that there’s a lack of any reach for meaning. 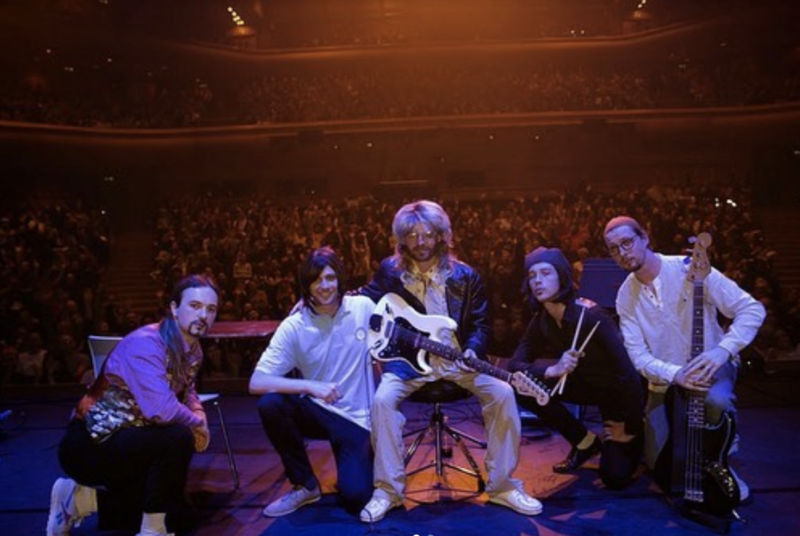 I travelled to the Barbican Centre on a Saturday night to watch an episode of a melodrama made by Connan and friends, followed by two live sets from Connan and his band. On arrival I was handed an explanatory sheet of paper detailing his somewhat accidental career and care-free process, featuring revealing quotes such as “It’s just ideas in my head that I put together and, later, might make more sense…. But I don’t think about the meaning at the time”. His natural streaming through ideas makes a lot of sense in retrospective. 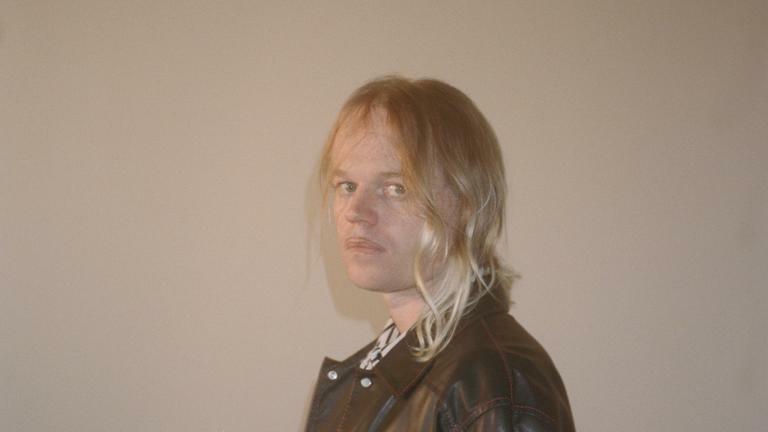 Witnessing Connan Mockasin’s stylistic progression through the years feels akin to becoming acquainted with the man, yet it’s still difficult to decipher the next move. His career started around Uuu it’s Teasy, an album that sounds like deranged psychedelia if it was conceived and recorded during the world wars. The absurd, hyper surreal Please Turn Me into Snat/Forever Dolphin Love that followed showed the whittling of this retro spirit into something far beyond any known knowns. Caramel’s follow-up revealed the humour that was always latent in his weirdness while paradoxically being his smoothest, simplest and most sensual work. Now is the time of Jassbusters, his most seductive and romantic album yet. The new release comes with a hint of lore and multi-media in the form of a 5-part ‘melodrama’ (in reality it’s an absurd, subtle and just plain weird comedy) called Botsyn & Dobsyn and the band called Jassbusters that lives in it’s fictional world. This performance in the Barbican Centre begins with the screening of the first episode. The tone of the episode is set immediately with cheap cardboard sets that feel both lifeless and claustrophobic, shot with a camera lense that really feeds into that melodrama feel. The acting is purposely bad, portraying vague intentions split with awkwardly long silences and it is all utterly hilarious. The audience certainly agrees with a near constant stream of giggles and recurring uproars of laughter through the whole episode. I’m becoming convinced that New Zealanders like Connan and Flight of the Concords are making a good case that where the UK dominate surreal and sarcastic humour, the US self-depreciates like no other, New Zealanders own the humour that cleverly portrays a nuanced childlike ignorance, awkwardness and incompetence. The general plot of Botsyn & Dobsyn follows a school student named Dobsyn who must improve on his grades in order to avoid being sent to military school. This takes us into the ambiguous relationship that then starts to form between Dobsyn and his new music teacher, Mr Botsyn (who, by the way, thinks Dobsyn is a girl). Mr Botsyn used to be in a band made up of teachers, called Jassbusters, which is where the concepts in this album start tying up; the song from the album are songs written and played by this make-believe band. It’s really interesting that after listening to the album Jassbusters multiple times, I would find so many little ‘aha’ moments watching this short episode. There are numerous references, lyrics and sounds that appear in some form on the album, as well as in the following live set which calls back to specific moments of the episode with pretty funny results. Something as simple as a door squeak sparks a laugh from the audience, for its timing and the context it happens. As soon as I heard the squeak, I could trace it back to a moment I heard that same sound on the album. Hearing samples like this in their diegetic origin feels like an epiphany as it forms the connections of these bits and pieces I’ve become unknowingly familiar with. The screening goes along famously well, and as applause washes along the credits the band takes to the stage, only increasing the roar of applause to include the building excitement. It turns out that the band we’re about to watch is Jassbusters themselves, playing a selection of songs from across the recent ‘self-titled’ release. Mr Botsyn (Connan in character) opens with the plucky nylon sound of “Les Be Honest”, and its a wonderful sound that begs the question of how he found it on an electric guitar. Then the multiple part vocal harmonies that awash the song come in, all band members singing along, and the resulting sound is filled with bliss. It’s clear that the live mixing and sound system are reaching perfection, fully enabling if not even magnifying the lushness of the music. “Charlottes Thong” comes out early in the set and sounds as infinite live as on track. Every otherworldly tone found on the guitars gently mingle with one another, the bass has a presence easily balanced with the guitars and the drums which are played with such a loving attentiveness. Between songs Connan says “the next song is dedicated to a special…” and just gives up on finishing the line, wringing out another laugh from the crowd in a way only he could. It’s not an empty phrase however, revealed as the actor portraying Dobsyn comes out in character to sit at a desk while Connan serenades him with “Last Night”. His singing in this is playful and filled with a doggish energy directed to Dobsyn. It’s both humorous and sensual. Near the end of the set, Connan/Mr Botsyn say “we’re just the support band so we can’t play much longer” and closed with “Con Con Was Impatient”. After the interval, Connan entered the stage solo with a new outfit on, this one featuring a cap that partially obscured the vision of his eyes, only growing the mystery that surrounds him. It’s impossible to guess what he’s thinking but through his laid back comfort and childlike goofiness, he still feels so relatable and its as if he know you. He noodles on his guitar, singing a quiet rendition of the end of “Lying has to Stop”, the lead single with another project of his, Soft Hair. Once his band all enter as themselves as opposed to Jassbusters, they spring into “Faking Jazz Together”. The entry of the groove that comes with the bass and drums (played by Nick Harsant and Matthew Eccles respectively) is so strong that it receives applause both times it happens. At the songs’ end, the musicians expertly ‘fade’ themselves out of the track together, creating a soft exit that leaves only a high-pitched pad sound hanging like a spectre in the room. The bass and drums re-enter with a partial groove for a moment but leave as the guitarist Rory McCarthy enters with his own moment which feels haunting yet fleeting. The rest of the band blend themselves back into the mix, creating a jam out of the song “Quadrospuss Island”. The rendition of “Forever Dolphin Love” starts to gradually speed up around the instrumental section on it’s tail end, going for a while before they bring back the verses for a speedy romp through them, showing a new energy to the track. Beyond just seeing these songs performed live, there is often some variation or twist in the ideas presented. Connan’s bendy string style has bled into many of his songs over the years, but the gentle guitar stroking approach which makes notes so subtle and shy sounding has grown into him and Rory so that everything brought to the stage flows through the air and to the ears with a sound so delicate, such as in “It’s Choade my dear”. Connan introduces by reference to a trick he learnt in maths class – an ocarina sound made by whistling through the hands; an ‘instrument’ he makes playful use of later in the song. When they kick into “I’m the man, that will find you”, model Naomi Shimada who graces it’s music video also spontaneously graces the stage (she had been in the audience just to watch until now) to sway around and greet the band members along the stage. To close the entire show, the bassist asks the audience to help him make a sound with their voices. It turns out to be the one which opens “Lying Has to Stop”, the soft hair track Connan teased at the beginning of the set. It’s both fun and beguiling, as is a lot of his music. Showcasing a new level of authenticity to his sound threaded into his emerging sense of candour and docile humour and visa versa; they form the quilt of Connan’s public persona. The image of Connan Mockasin fades back into his sounds of haunted psychedelia and sensual surrealism. It’s impossible to separate the man from the cloth he wove. It’s impossible to know what he’s thinking and it will always feel like he knows something we don’t, but it will never matter when he continues to gift us with a sound that’s eternal.